Last week, gold juniors led the way as the top gainers on the TSXV, with Max, African Gold, Oceanus and Great Bear making appearances. This past Friday (February 8), the S&P/TSX Venture Composite Index (INDEXTSI:JX) was down by 3.21 points, or 0.52 percent to 611.67. 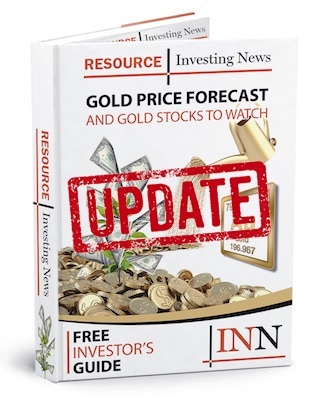 In commodity news, gold was keeping above US$1,300 an ounce while iron prices were surging off the back of Vale’s (NYSE:VALE) ongoing beating after the collapse of the Córrego do Feijão tailings dam. Interest in gold juniors was high this week, as shown by the list of top five gainers on the TSXV. Read on to find out which companies made the list, and a little about what they’ve been up to. Canadian-based, Colombia-focused Max Resource highlights the South American country as an ideal locale due to its leadership in Ivan Duque, who the company describes as a “pro-business, centre-right politician”. Earlier this week, the company released news about its flagship Choco precious metals project near Medellin, reporting it has located a gold-bearing conglomerate with exploration ongoing on the property. On the TSXV, Max Resource’s share price increased by 86.11 percent over the week to C$0.33. The company’s most recent news was back in November 2018, when it announced a private placement to raise US$1 million to continue developing Kobada. In Toronto, African Gold was trading at C$0.03 on Friday, up 40 percent over the course of the week. A gold- and silver-focused company, Oceanus Resources pegs itself as a developer with its focus on its El Tigre project in northern Sonora state, Mexico. Oceanus is still exploring El Tigre, with its maiden resource estimate published way back in 2017. So far, the only news from Oceanus in 2019 has been a 2018 review, where it detailed its prospective and mapping activities at El Tigre over the year, and reported that it would be doing more exploration this year. The company was trading at C$0.11 on the Venture Exchange on Friday, with its shares up 35.29 percent for the week. Great Bear Resources is a Canadian exploration company focused on advancing its high-grade gold assets in one of the world’s premiere mining jurisdictions. The company had big news last year, announcing in August 23 a C$10-million private placement and investment from McEwen Mining (TSX:MUX,NYSE:MUX) a gold-mining company lead by Rob McEwen, founder of Goldcorp (TSX:G,NYSE:GG), after it reported some handsome numbers from its Dixie project in Ontario. No big news this week, but earlier in January Great Bear reported more drill results from Dixie. The company’s share price was up 31.29 percent on the TSXV last week, trading at C$3.65. Breaking a combo of gold juniors, Rathdowney Resources is focused on developing its flagship Olza zinc–lead-silver project in Poland, where it has so far spent more than C$25 million on exploration and development. Located in the Upper Silesian mining district, Olza has a historical estimate of 77 million tonnes grading 6.15 percent zinc-lead using a Soviet-era measurement, while the company’s own drilling has delivered an inferred resource estimate of 24.4 million tonnes grading 7.02 percent zinc-lead. No fresh news from Rathdowney, which last put out a release in August 2018 on an extension on share purchase warrants. In Toronto, the company was trading at C$0.13 last Friday, after gaining 23.81 percent over the week. Editorial Disclosure: Great Bear Resources is a client of the Investing News Network. This article is not paid-for content.